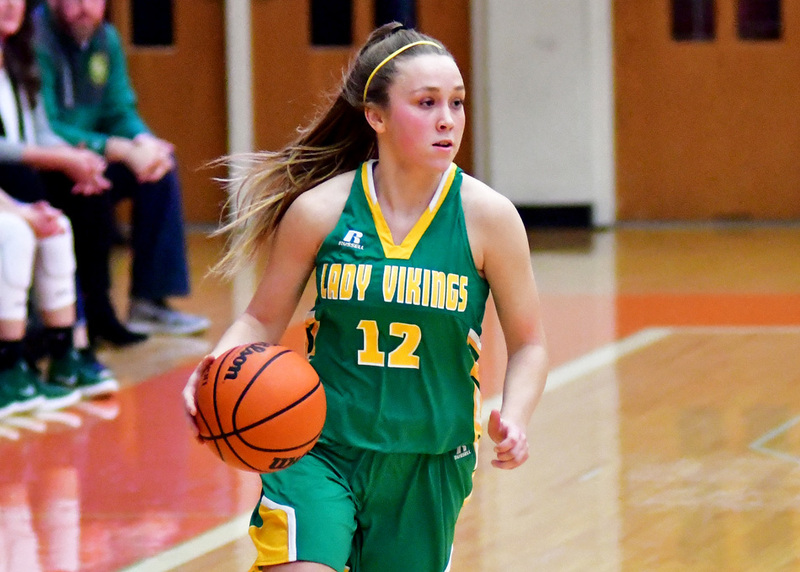 Tippecanoe Valley finally played at home, and split its two games in its home tourney. After playing its first five games on the road to start the season, Valley beat Goshen 51-41 in its first home game in the morning session of the tourney. It’s only loss to that point was to Bremen in game one, and the two would meet in the final after the Lions topped Whitko 55-27. Bremen added another quality win to its slate with a 52-47 win over the Vikings in the championship. Goshen won the consolation game over Whitko, 50-47. Stats for the tournament were not immediately provided. The All-Tournament Team included Bremen’s Kaelyn Shively, Erin Coffel and Karlee Feldman, Valley’s Emma Craig and Sophie Bussard, Goshen’s Brynn Shoup-Hill and Whitko’s Emalee Duggins. Valley (5-2) will stay at home for a seven-game homestand, next entertaining Plymouth on Thursday. Kaylee Patton had herself a big night on one of the biggest stages Saturday. Patton scored 16 points in the massive New Castle Fieldhouse, which holds the country’s largest capacity at over 9,300. Patton’s seven points in the first half helped Warsaw outscore New Castle 21-7 in the second quarter to take a 26-12 lead. Abby Sanner scored eight of her 10 points in the first half and Maddie Ryman added eight points and five boards. A hot start and even hotter third quarter helped the Warsaw JV to a 57-28 win over New Castle. Sanner played just two quarters of the JV game but had 18 points and nine rebounds. Warsaw led 28-15 at the half, but came back with a 17-2 third quarter to pull away. Warsaw (4-4) will host Oregon-Davis Thursday. Triton couldn’t find its scoring touch in its two games at the Trojan Tourney. Triton lost to Sheridan 35-24 in the semis, with Lexia Hostrawser leading the way with nine points for the hosts. Heather Barker and Olivia Raines each had nine points for Sheridan. In the consolation game, Triton upped its point total, but couldn’t stop Leo in a 52-37 final. Jaela Faulkner paced the home side with 10 points with Hostrawser just behind with nine points. Brooke McGee had 13 points and the trio of Jocelyn Roth, Cate Steward and Hannah Adams all had 10 points. Lakeland won the title, beating Leo 57-49 led by Bailey Hartsough’s 18 points. In the final, Hartsough again led the squad with 14 points and Madison Keil added 12 points in a 54-40 win over Sheridan. Raines and Barker each had eight points for Sheridan. Triton (1-8) visits LaVille Wednesday to open Hoosier North Athletic Conference play.